One of my personal goals has been to eat less sugar, lower carb (notice that says LOWER not LOW or NON...Haha), and still enjoy life on occasion. Mostly fueled by my desire to feel better health wise. But, let's be honest...this girl still needs a good dose of chocolate. Enter lower carb treats. Until recently, I didn't realized that there was a thing such as low sugar (and sugar free) dark chocolate chips that actually taste good. Scratch that. They taste BETTER. Not kidding! 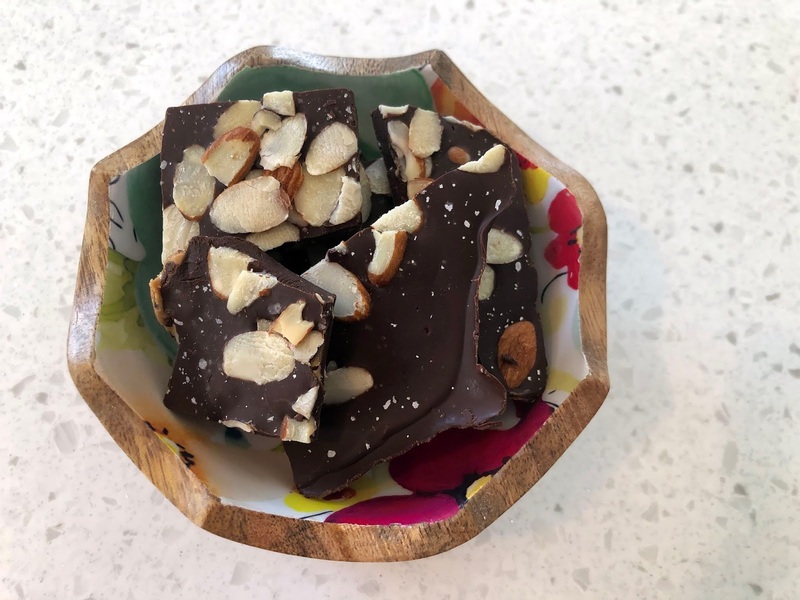 Anyway, this super easy lower carb Dark Chocolate Bark whips up in minutes and can be ready to devour in half an hour. In a large microwaveable mug, melt chocolate chips and coconut oil in 30 second intervals. Stir between each interval until chips are melted Immediately add peanut butter. Mix well. Spread mix onto wax paper (I lined a square casserole dish with wax paper). Sprinkle almonds and sea salt. Freeze for 30 minutes. You will want to set the bark out for a few minutes, then break apart and store in the fridge. Mine stored well for three days.